The eagle and the hawk. A battle worthy of the Red Baron. I observed a battle overhead yesterday. It was worthy of the Red Baron. A red-tail hawk was attempting to shoo a bald eagle from a patch of sky it deemed proprietary. The eagle wasn’t terribly phased, even as it was being attacked by the largest of the hawks. From above the hawk watched the eagle. The eagle watched the ground. 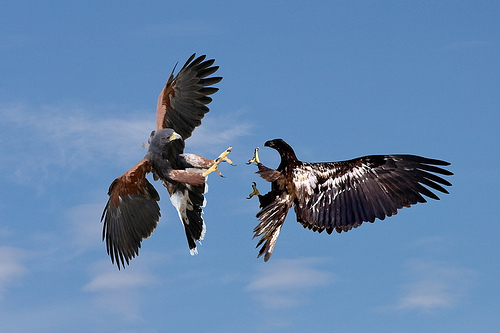 This would go on a minute or two, then the hawk would draw its wings slightly and drop on the eagle, who, waiting until the last moment, would flip sideways and defend itself with its talons. I watched through my field glasses for five minutes or more. Finally, the two drifted over the tree horizon, still tangling. I can only assume they continued the aerial ballet beyond my view. Who was established as top of the food chain for that specific parcel of blue sky is unknown–but I would put my money on the eagle. Of the eagle and the hawk? How did this link come to be? I have lived in the world of interpretation (the artist), and participated as one of those wishing to explain (the journalist), and I have questioned (the philosopher)–but I have understood very little. Above me, on the wing, simple biology played out, but I understood very little of it. My needs grow simpler as I grow older. I require less interpretation, less explanation, tolerate fewer questions. Understanding is what I seek.